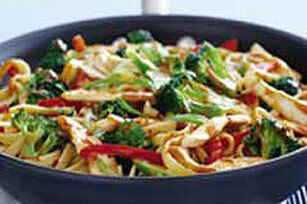 Spring into action with this Spring Stir-Fry in Peanut Sauce Recipe. This vegetable-focused dish is worth it for the peanut sauce recipe alone. Mix dressing, peanut butter, soy sauce and crushed red pepper; set aside. Heat 2 tsp. of the oil in large nonstick skillet on medium-high heat. Add chicken; cook and stir 5 to 8 min. or until chicken is cooked through. Transfer chicken to large serving bowl; cover to keep warm. Heat remaining 1 tsp. oil in same skillet. Add broccoli and bell peppers; cook and stir 5 min. or until vegetables are crisp-tender. Add pasta, vegetables and dressing mixture to chicken; mix lightly. If desired, gradually stir in enough of the reserved pasta cooking water until sauce is of desired consistency. Sprinkle with the onions.